This title was first published in 2000: Reverent memorial for the dead was the inspiration for the production of a significant category of artworks during the Middle Ages - artworks aimed as much at the laity as at the clergy, and intended to maintain, symbolically, the presence of the dead. Memoria, the term that describes the formal, liturgical memory of the dead, also includes artworks intended to house and honour the deceased. This book explores the ways in which medieval Christians sought to memorialize the deceased: with tombs, cenotaphs, altars and other furnishings connected to a real or symbolic burial site. A dozen essays analyze strategies for commemoration from the 4th to the 15th century: the means by which human memory could be activated or manipulated through the interaction between monuments, their setting, and the visitor. 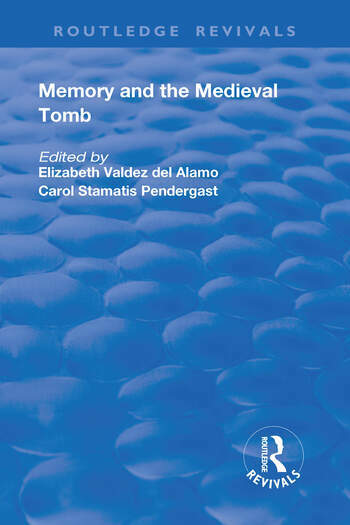 Building upon from the growing body of literature on memory in the Middle Ages, the collection focuses on the tomb monument and its context as a complex to define what is to be remembered, to fix memory, and to facilitate recollection.